2011. 27 min. Directed by Cyril Christo, Marie Wilkinson. 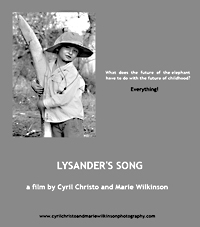 What does the future of the elephant have to do with the future of childhood? Everything. This short documentary features interviews with native tribespeople primarily in northern Kenya on topics such as climate change, globalization, and life with the disappearing elephants. The film was screened on Tuesday, September 27, at the Museum of Modern Art in New York. The film combines wildlife footage with the concerns and legends of the indigenous people, exploring their unique relationships to/with the elephant.